If you’re an avid marine fisherman you might want to look into picking up a high-quality saltwater spinning reel for your adventures. Whether you’re on a boat or fishing off the shore, you’ll love the convenience and simplicity of using one with no fear of backlash and tangled lines. For oceanic fishing, there’re a few different qualities you’ll need to make sure your reel has. Foremost, you’ll want to pick something anti-corrosive, saltwater and the things underneath it can play havoc on a reel that’s not ready for that kind of stress. You’ll also want something a little bit heavier than a freshwater reel, the ocean is the biggest body of water on the earth and that means that in general you’ll find that the fish are bigger. Tastier, too, in some people’s opinions, but it’s the size that’s a factor for your reel. We’ve gathered together top 5 of the best saltwater spinning reels you can find in order to give you a handy guide to making an informed purchase. With any of these, you’ll be able to rest assured that they’ll give you long service and ensure a satisfying angling experience. 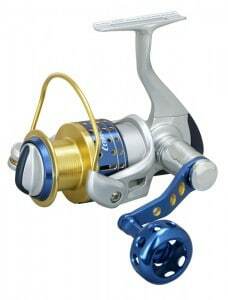 The Okuma Cedros line of reels is a great match for any saltwater angling experience. It comes in six different models and boasts an amazing amount of anti-corrosive technology as well as high gear ratios to allow you a massive amount of retrieve with each turn of the handle. Add in the five, high quality, shielded bearings and you have a reel that will stay smooth through the whole day. The Cedros High-Speed series is specifically made for marine use, and in the right size and pairing, you’ll find yourself able to fish for tuna and snapper with ease. It comes in at a reasonable price and if you’re unsure of what exactly you want out of a spinning reel, this line of high-tech, saltwater specialized reels is one of the best places to begin. 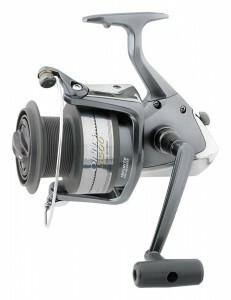 The Penn Spinfisher V is a fantastic reel series, especially for the price. Penn continues their tradition of no-nonsense added reels here, and it’s perfect for almost any marine application. One of the best features of this particular reel is that it’s water-tight, so if it gets dunked in the sea or dropped in the sand you won’t have to deal with a crunchy, stuttering retrieve like you can end up with a lot of models. It comes in an amazing thirteen different models, so you’re sure to be able to find one to meet your exact needs. Whether you’re trolling or fishing in the surf, the Penn Spinfisher V series of reels is sure to have exactly what you need. A purchase of one of these durable, high-quality reels is a great investment in your fishing future. 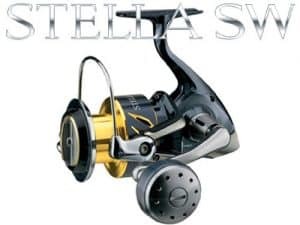 For those who are looking a serious investment into their marine angling gear, the Shimano Stella SW comes in at luxury prices and astounding quality. These are among the greatest spinning reels on the planet, and the price tag matches. These reels come in twelve different models so if you’re going to make the investment you’ll want to size one for your exact needs. They feature tons of Shimano’s best available technology, making for a powerful, durable reel which works smoothly and boasts amazing drag. The bearings are of the highest available quality, and the Shimano Stella SW boasts a staggering fourteen of them, virtually guaranteeing that you’ll receive the smoothest saltwater spinning reel available. 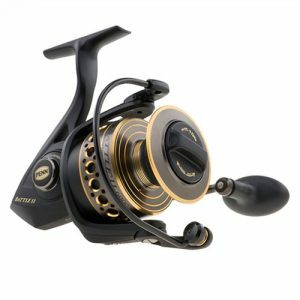 If you’re serious about having the best and price is no object, you can stop reading here, order one of these, and rest assured that these fantastic reels are perfect for you. The Daiwa Opus series comes in as a complete bargain, it’s priced low but you’ll find it highly durable and they’ll last for a long time with proper maintenance. You’ll find that this reel is excellent for lighter marine applications, and especially for surf fishing. It’s not the smoothest or most powerful reel out there, but as a general workhorse for fish in the twenty to forty pound range, you could spend a lot more and get a lot less than if you pick one of the Opus series of reels. For those who are just getting into mid-range saltwater fishing or want to try their hand at surf fishing, though, one of these high-quality reels is a fantastic way to go. 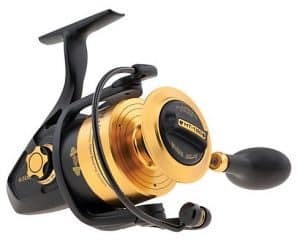 The Penn Battle II series of reels come in a wide range of sizes and for the serious marine angler, one of these is sure to add to your fishing experience in a big way. These reels might need a bit more regular maintenance than some of those on the list if you’re solely fishing in saltwater, but if you take the time to care for your gear this is one of the best options available. For pier and rock fishing the Penn Battle II is simply a superior option, and the price comes in at a bargain. For those who want the assurance of high-quality and a versatile reel that will be suited for almost any angling adventure, just get yourself a Penn Battle II in the size you prefer and you can be assured you’re good to go for whatever may come.